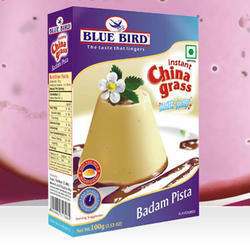 We are a leading Manufacturer of badam pista instant china grass, chocolate instant china grass, chocolate instant pudding, ice-cream mix, kesar pista kulfi mix and kesari pista instant china grass from Mumbai, India. BLUE BIRD Instant Pudding is an excellent choice for an instant dessert with a tasty caramel topping to go with it. Especially for unexpected guests and friends. 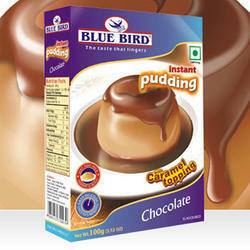 Empty contents of Caramel Topping pudding into a ½ litre mould of 5 small moulds. 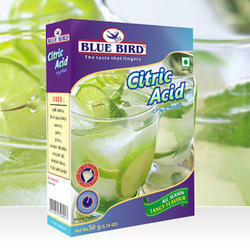 Add contents of the powder in 500ml. of milk, stirring to keep mixture smooth. 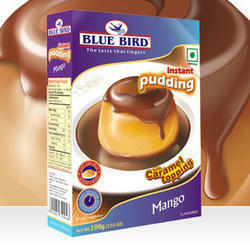 Cook over medium heat, stirring constantly until mixture comes to a full bubbling boil. 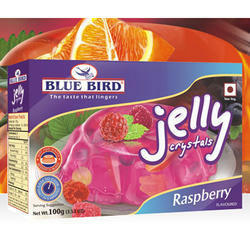 Remove from heat and while cool slowly pour into prepared mould. Mixture will thicken as it cools. 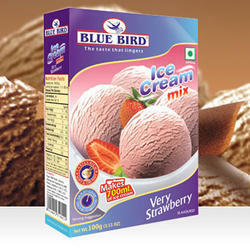 Refrigerate at least 1 hour without stirring. 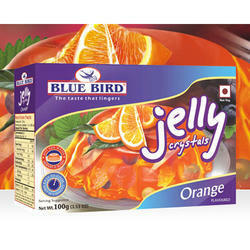 To un-mould, loosen edges of flan from mould with the tip of a knife. Cover with plate, invert plate and mould. Remove mould. 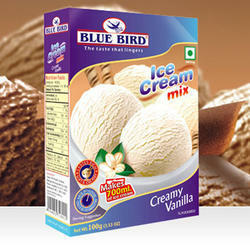 BLUE BIRD ice cream mix makes it simpler to make it at home. 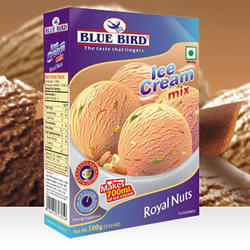 Ice Cream served by itself or with fruits, dry fruits and chocolate sauce completes your meal. Take 400ml. fresh milk. Boil for 3 minutes stirring continuously. Allow the mixture to cool at room temp. 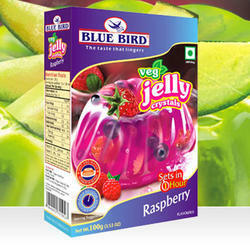 Then put into the freezer for 1 hour. 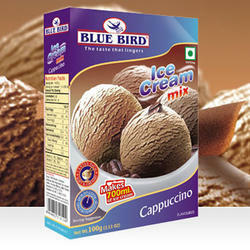 Remove the mixture from the freezer and whip (with electric / manual whipper) for 3 minutes. Pour mixture in an airtight container & freeze for 4-5 hrs. depending on the cooling of your refrigerator. Garnish and serve. BLUE BIRD Custord Powder is 100% vegetarian with absolutely no egg content. It can be had plain or with jellis, fresh or stewed fruits. 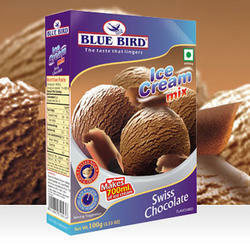 It can also be served with truffles, cakes and pastry fillings. 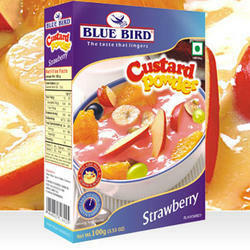 Measure Blue Bird Custard Powder (20g. for Custard Sauce, 30g. 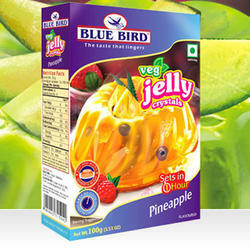 for Fruit Salad, 40g. for Pudding) into a bowl. 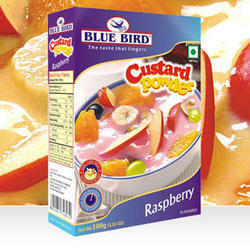 Add ¼ to ½ cup milk to make a smooth paste. 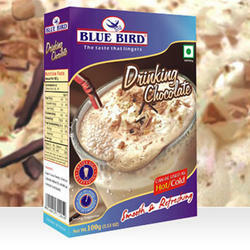 Boil the 500ml milk with 50g. sugar stirring it properly. Then remove from heat. Add the paste and cook again for 2-3 minutes, stirring continuously to avoid burning. 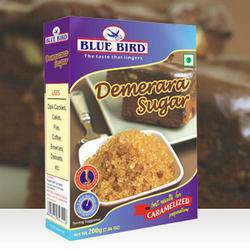 Dark Cookies, Cakes, Pies, Coffee, Brownies, Desserts, etc. 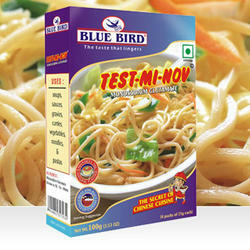 BLUE BIRD Test-Mi-Nov known as Aji-no-moto is a flavouring agent which enhances the taste and brings out the natural flavour from within. It is obtained from vegetable sources & mainly used in Chinese cuisines. 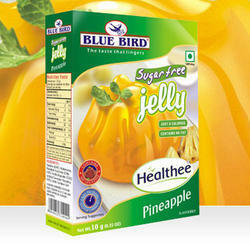 BLUE BIRD Sugar Free Jelly the ideal low calorie dessert is the best for calorie conscious or diabetics. A unique range of healthy products has been developed for a real mass of fitness crazy world. 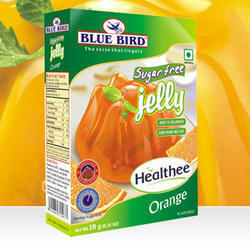 Sugar free jelly is for those who don’t want just a single more calorie or people who want to have the best quality dessert without sugar. 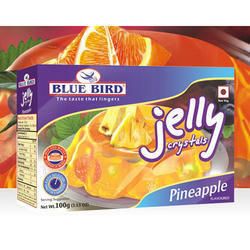 Add Blue Bird Sugar free Jelly to boiled water and stir vigorously until fully dissolved. 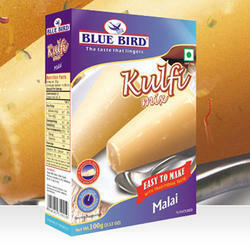 Remove from heat and slowly pour into moulds. Jelly will thicken as it cools. To unmould loosen edges of the flan from mould with the tip of a knife. 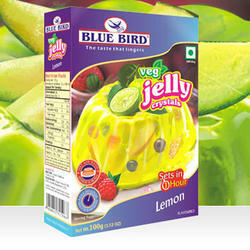 Top with plate, invert plate & mould. Now remove the mould. 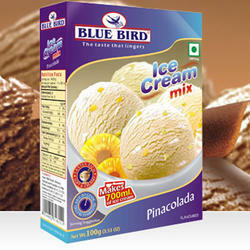 Looking for Dessert Mixes ?